This article firstÂ Â appeared as a Colorado Parks & Wildlife Press Release on December 23, 2015. We live in a visual candyland here in Colorado, and dog owners love nothing more than getting out into the natural beauty with their dogs. Whatâ€™s wrong with that? On the surface, itâ€™s a great thing to get exercise for both dog and owner. Unfortunately, there is often one thing missing on the trails, the lack of which endangers dogs, people and wildlife: a truly reliable recall to which a dog will respond. Can you honestly call your dog off from its thrilling chase of wildlife? Dogs chasing wildlife is not only illegal, itâ€™s dangerous for everyone. Wild animals cannot afford the calories, stress and dangers from a high-speed chase. 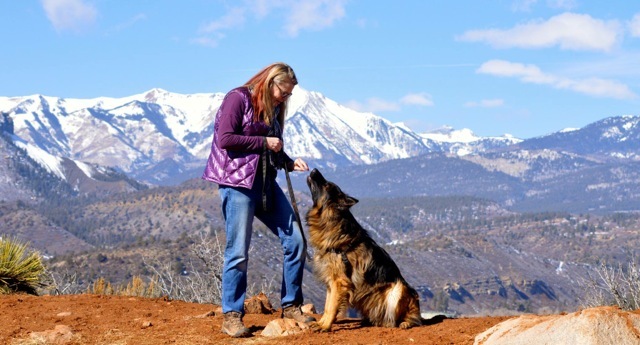 Dogs that donâ€™t have a reliable recall get lost in the mountains nearly every week. If I had a dollar for every client who called me after their dog was attacked by another off-leash dog, I would be a very rich dog trainer.